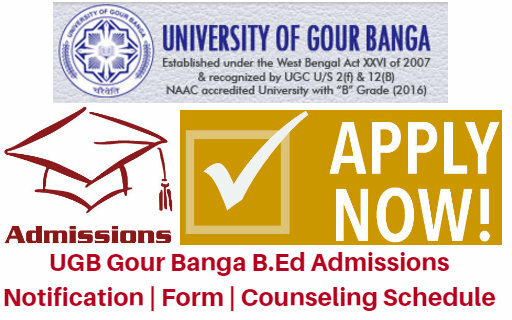 The University of Gour Banga (UGB) invites applications in prescribed forms for admission in B.Ed Two Year programme for the academic session 2019-20. The Prospectus and Application Forms can be obtained from the official website of Gour Banga University. The University of Gour Banga (UGB) is going to invite the applications from eligible/ interested candidates to take part in the B.Ed (Bachelor of Education) Program offered by the University. The Candidates, who want to take admissions in the UGB University, they can apply for the UGB B.Ed Online Form through official portal. The Admission Cell of Gour Banga University is ready to advertize in regards of Admissions to B.Ed 2 Year Course for the Academic Year 2019-20. The UGB B.Ed Online Form will be available soon on the official website of Gour Banga University. All Eligible Candidates, who want to take Admission in B.Ed course, they can apply online application form before the last date through official web portal. The UGB B.Ed Admission will be based on Merit List generated by the Department of Gour Banga University. Both Fresher and Deputed Candidates with at least 50% Marks in the Bachelor’s Degree or in the Master’s Degree are eligible to apply. In case of Bachelor Degree with Honours, 50% marks in Bachelor’s Degree means 50% marks in aggregate of Honours Subject + Pass Subjects (5% relaxation for SC and ST candidates). Deputed Candidates: Candidates will be selected on the basis of Experience . Only the untrained in-service teachers, teaching classes IX-XII in Govt. aided institutions will be treated as eligible. Fresher Candidates: Selection of fresher candidates will be made on calculation of score marks on the basis of their academic qualification as per G.O. Physically Handicapped Applicants: Selection of Candidates belonging to PH category will be on the basis of (a) Percentage of disability (40%) for threshold criteria. (b) score/marks according to their qualification as per G.O. of D.P. For all Students: Rs 700/-. Visit the official website of UGB at www.ugbadmission.com. Click on the “B.Ed Admissions 2019-20”. Online Applications Started: April 2019. Last Date For Online Applications: April 2019. Counselling & Admission: May 2019. The Selection of Candidates is based on the merit list generated by the Department of UGB. UGB B.Ed Merit list 2019 will be prepared according to the marks obtained / percentage by the Aspirants in B.Ed or other Courses. The UGB B.Ed Merit list will be updated soon on the official website. Final merit list for counseling will be published along with the counseling programme schedule at the Notice Board of University of Gour Banga and in the website www.ugb.ac.in / www.ugbadmission.com. On the Counseling date the candidate must be present 30 minutes before commencement of counseling with print out of Online Application Form alongwith all the original documents for verification by the authority. During counselling, after booking a college, all candidates have to deposit Rs. 2,000.00 (Rupees Two Thousand Only) as “Counselling Fees” to the college authority which will be refunded at the time of admission. The “Counselling Fees” is non-refundable to those candidates who will not take admission after counselling. Candidates are to bring Original Photo Identity Card for verification. Untrained in-service candidates, teaching class IX-XII in Govt. aided schools only, shall be treated as deputed. If the seats, reserved for deputed teachers, remain vacant, those seats will be de-reserved and offered to the fresh candidates. Univesrity Name:University of GOUR BANGA . Official Website of University: www.ugb.ac.in . Sir I want your UGB under B.Ed colleges admitted in B.Ed course but I don’t understand that your fast than other universities.so how to get chance your colleges.Sir I sympathetically requested you that give our chances.I.e. I complete my graduation exam in this year from Tilka Manjhi Bhagalpur university But our result not published.Probably published soon July between August. So I humble requested that give me chance for B.Ed Admission.